On Friday December 19th, the General Assembly of the United Nations passed a resolution recognizing the Permanent sovereignty of the Palestinian people in the Occupied Palestinian Territory, including East Jerusalem, and of the Arab population in the occupied Syrian Golan over their natural resources. The Assembly adopted the resolution with a recorded vote of 165 in favour to 6 against (Canada, Israel, Marshall Islands, Micronesia (Federated States of), Palau, United States) with 9 abstentions (Australia, Cameroon, Cote D’Ivoire, Honduras, Panama, Papua New Guinea, Paraguay, Tonga, Vanuatu). Through that resolution, the Assembly demanded that Israel cease exploiting, damaging, depleting and endangering the natural resources in the Occupied Palestinian Territory and the occupied Syrian Golan. It also called for immediate and safe removal of all unexploded ordnance in the Gaza Strip, and for support for the efforts of the United Nations Mine Action Service in that regard. The resolution was one of 43 adopted by the General Assembly on Friday. 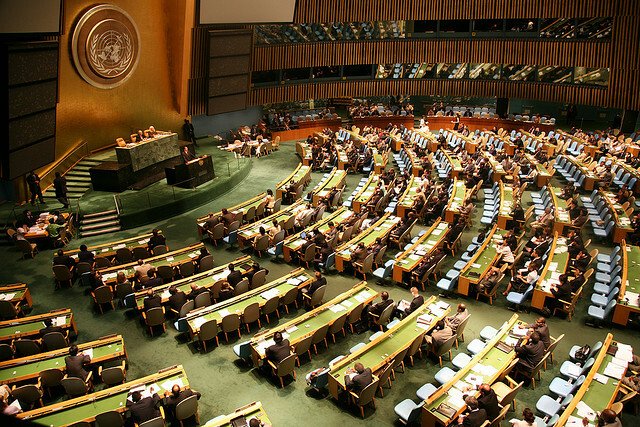 A second resolution related to Palestinian rights was adopted without a vote – it called for Member States, international financial institutions of the United Nations system, intergovernmental and non-governmental organizations and regional and interregional organizations to extend economic and social assistance to the Palestinian people, in cooperation with the Palestine Liberation Organization and through official Palestinian institutions. It stressed the importance of following up on the results of the Cairo conference on Palestine, “Reconstructing Gaza”, to promote economic recovery and reconstruction in a timely and sustainable manner. Sebastiano Cardi, the representative of Italy, speaking for the European Union, introduced the draft resolution titled Assistance to the Palestinian people. According to the United Nations General Assembly minutes, after several years when the draft text had only contained technical updates, the current draft contained updates on the situation, including the summer conflict in Gaza. As such, a consensus approach continued. Among the text’s elements, a range of issues were addressed, among them an aim to ensure the safety of civilians. The text also underlined the importance of action on reconstruction in Gaza and the importance of the work provided by humanitarian personnel. A third resolution that was passed in relation to Israel on Friday was aU.N. General Assembly resolution asking Israel to pay Lebanon over $850 million in damages for an oil spill caused by an Israeli air force attack on oil storage tanks during its war with Hezbollah in July 2006.